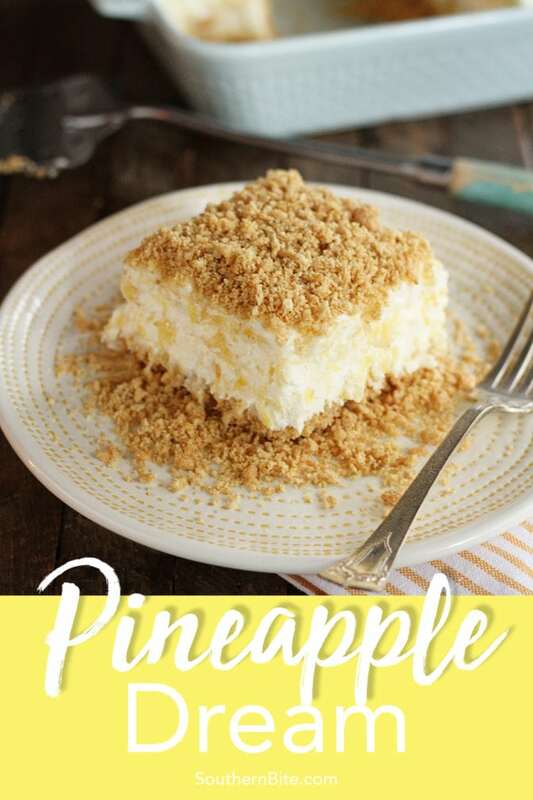 This Pineapple Dream is one of those recipes that’s been floating around for years – and for good reason… it’s AMAZING! 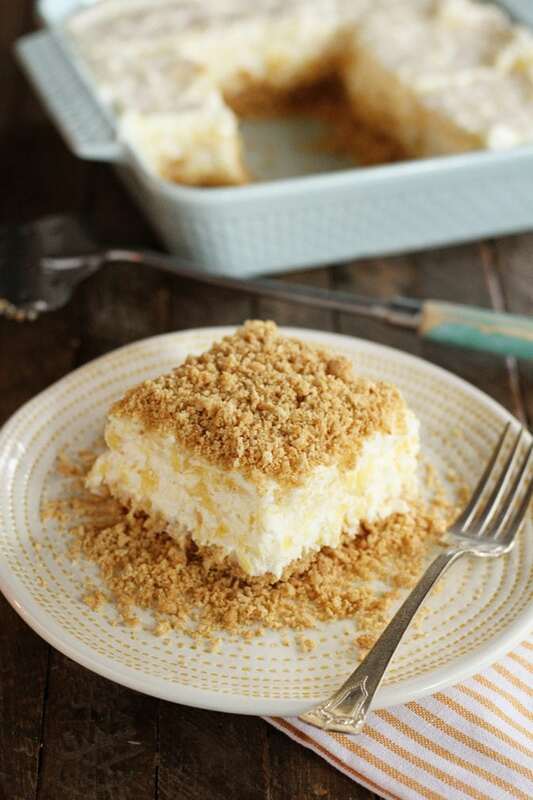 It’s a light, fluffy dessert of crushed pineapple, cream cheese, and whipped topping, all sandwiched between layers of a delicious graham cracker crust. 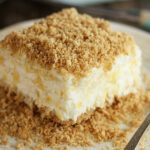 Traditionally, the filling is two layers and the crust and topping is just graham cracker crumbs and butter. I’ve updated it to make the process simpler (without any loss in flavor) by turning the filling into a single layer and added even a little more flavor to the crust. It’s the perfect summer dessert that y’all are just going to devour. It also makes a killer potluck dessert. Everyone will be asking for the recipe! Y’all are gonna love it! 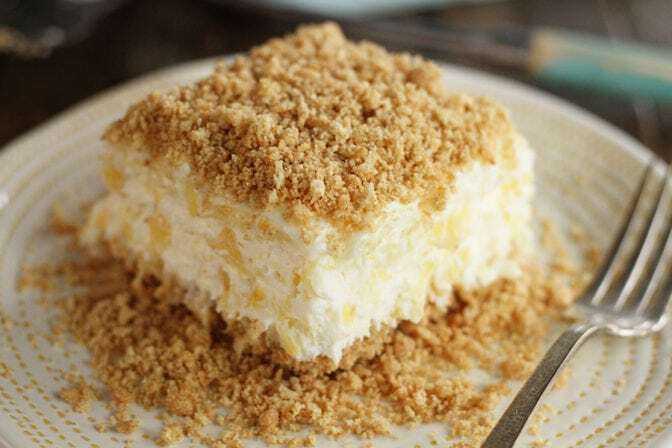 Melt the butter and combine the graham crackers, butter, sugar, and salt. Stir until the graham crackers are coated in the butter. 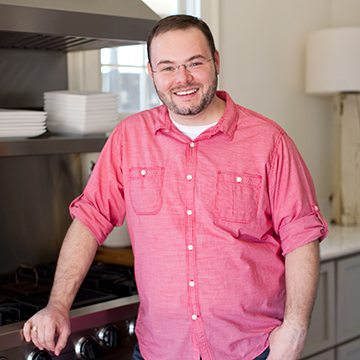 Pour about 2 cups of the mixture into the bottom of an 8x8-inch baking dish and firmly press flat to form the crust. I like to use the bottom of a metal measuring cup for this. Set the remaining crumb mixture aside to be used as the topping. Bake the crust for about 10 minutes. Cool completely. In a large bowl, beat the cream cheese and butter together. Add the powdered sugar and mix well. Add the drained pineapple and stir to combine. Fold in the whipped topping. Once the crust has cooled, spread the pineapple mixture evenly over the crust. Sprinkle the top with the remaining crumb mixture. Refrigerate overnight (or at least 4 hours) to allow the filling to set. Thank you for this post and memory! 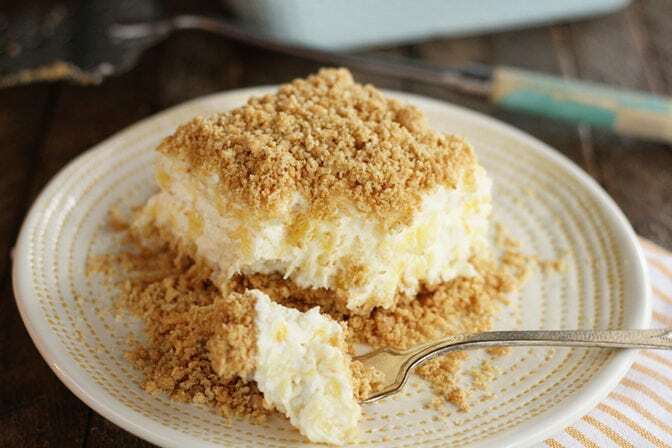 My Mama used to make this recipe but she called it refrigerator cheesecake. In fact, she preferred it frozen and served it that way! She has been gone for a few years now and it has been several more before that since she last was able to make this. I had completely forgotten about it and am going to her recipe book to see if I still have her copy-hope it is in her handwriting! But it is nice to know I have this one as a backup! 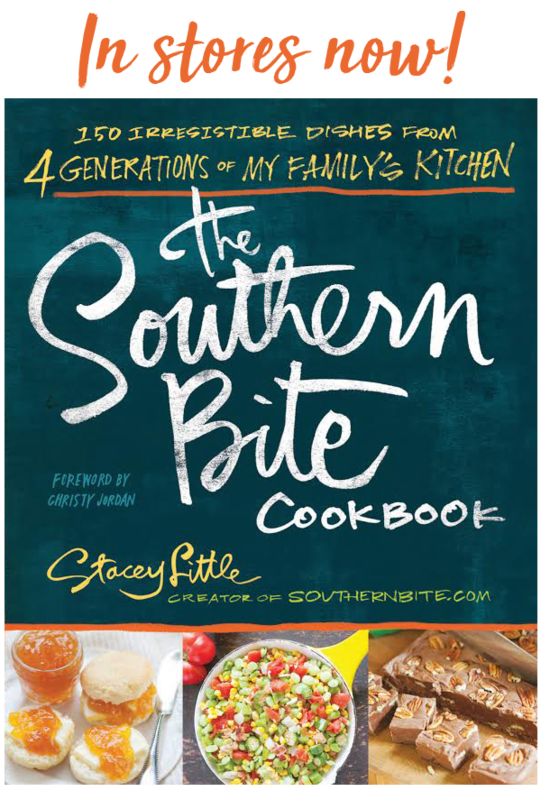 Those handwritten recipes are such treasures, Vickie! This looks absolutely delicious and refreshing! I can hardly wait to try it. Thanks, Stacey. Thanks! I sure hope you’ll enjoy it!! I bet this tastes amazing. I love the combination of creamy and crunchy! Thanks, Julie! We just love it! I made this as written for Father’s Day. Very easy and pretty good. I think it would be better with 2 cans of well drained pineapple which should give it more of a pineapple flavor. Hmmm… interesting idea! I might have to try that. I make one simular to this but with a layer of bananas then the pineapple and the cool whip on top sprinkles with pecans and cherries on top. We call it banana split cake! This looks like a version of a pie my Mother used to make many years ago called Million Dollar pie. Hers was in a graham cracker crust shell and also had pecans in it. It was SOOO good!